Home of Coca-Cola and host city of the 1996 summer Olympics, Atlanta’s thriving neighbourhoods are a fantastic mix of the modern and historic south. Home to a multitude of amazing attractions, including the World of Coca-Cola, The Georgia Aquarium and CNN studio tours, Atlanta also provides the perfect base for some great easy-to-reach southern gems. The following guide details the best day trips from A-Town providing memorable additions to your Southern experience. Situated an easy 30-minute drive to the East of downtown Atlanta, Stone Mountain Park is Georgia’s most popular attraction and features a variety of outdoor activities. Set in 3,200 acres of natural beauty Stone Mountain itself is a massive granite outcrop rising to over 800ft above the surrounding area and is famous for its rock relief carving of three notable confederate figures. 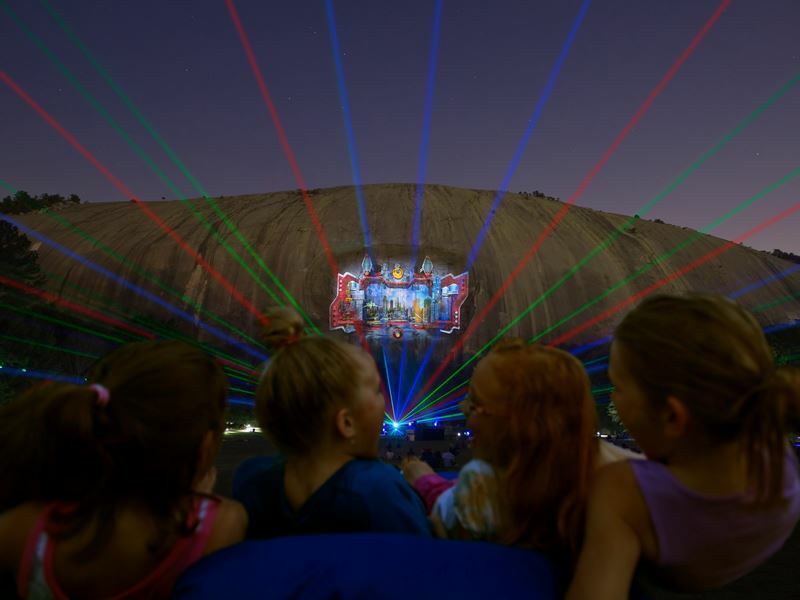 There’s plenty to see and do at any time of the year at the Stone Mountain Park complex. Start your visit by taking a breathtaking cable car ride to the top of Stone Mountain or, for the more energetic, there is a 45 hike to the summit - both options offering amazing views back over the city. Enjoy a scenic five-mile train ride around the base of the mountain, play a round of golf on one of the two 18-hole courses or hike one of the park’s many picturesque trails. The focal point for the park is Crossroads a mountain theme area of shopping and eating outlets. You’ll also find a thrilling zip line attraction here and close by the main lawn hosts daily night-time laser shows during the spring and summer. Wintertime hosts Stone Mountain Christmas, Snow Mountain and New Year’s Eve celebrations. Located in the foothills of the Appalachians and just over an hour’s drive from downtown Atlanta is the beautiful Victorian river town of Rome, GA. With its pleasingly traditional Broad street, downtown Rome has a wide selection of boutique shops and restaurant options. 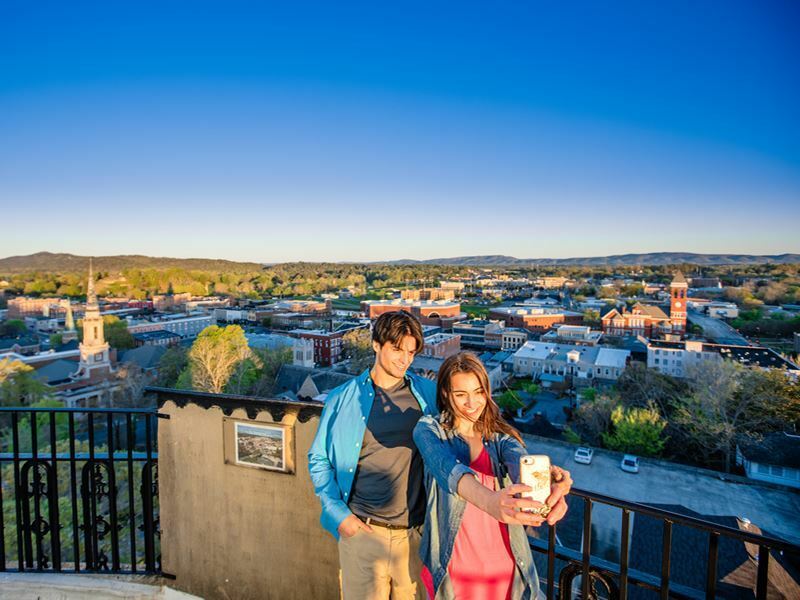 Well worth a visit is Myrtle Hill Cemetery, set high above the city and offering amazing views across downtown Rome and out across the rolling approaches to the Appalachian Mountains. Set on the side of Myrtle Hill graves are set amongst six terraces providing the perfect example of a historic, surreal and quintessentially southern cemetery. 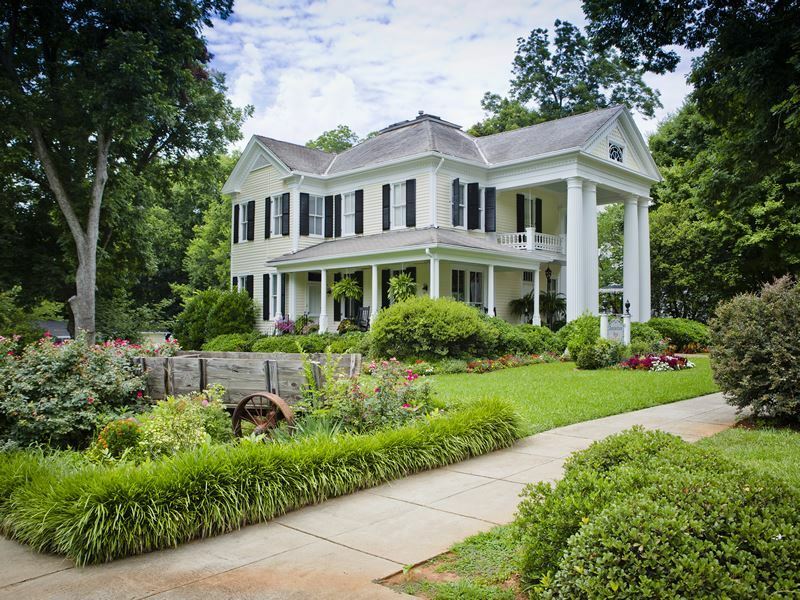 Head to the Between the Rivers area of Rome to experience the largest Victorian Era District in the state of Georgia with properties ranging from Greek revival mansions to cute gingerbread style homes and cottages. Just outside of town is Berry College campus with its stunning Ford Castle complex and immaculately kept grounds and diverse wildlife. Oak Hill & The Martha Berry Museum comprise an immaculate Greek revival home, home to the college founder, and a facility tracing the evolution of her schools and colleges. 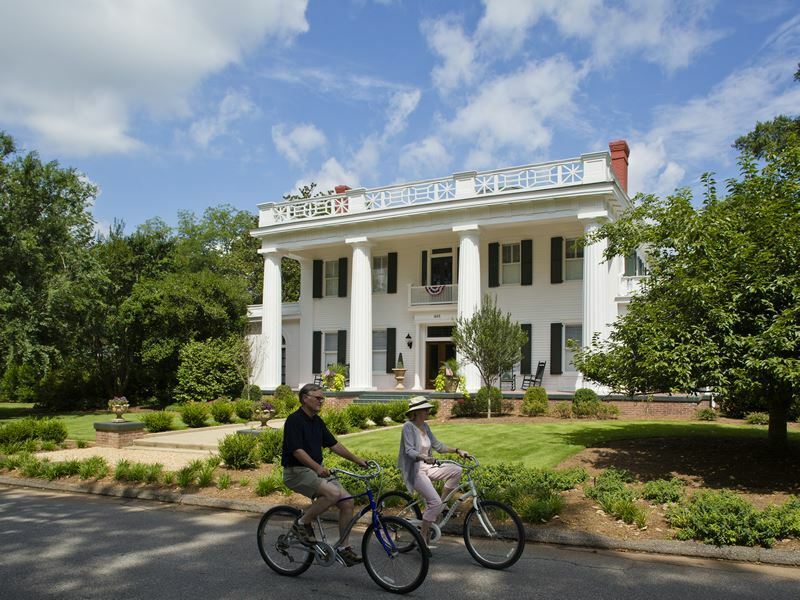 The home was also used as a key filming location in the Reese Witherspoon movie Sweet Home Alabama. Nestled in the foothill of the Blue Ridge Mountains, Dahlonega is the perfect mountain getaway being only and hour and a half’s drive from Atlanta’s city centre and accessed along miles of scenic highways. Dahlonega was the site of the first major U.S. gold rush, pre-dating those in California by over twenty years. For an insight into the life of a turn of the century miner head to the Consolidated Gold Mine for a fascinating tour and chance to pan for gold. You are also in the heart of Georgia’s wine country and Dahlonega is the perfect base from which to sample from the region’s burgeoning wine industry at one the many tasting rooms and wine shops. With over 20 vineyards and wineries to choose from there is something on offer for all budgets and tastes. 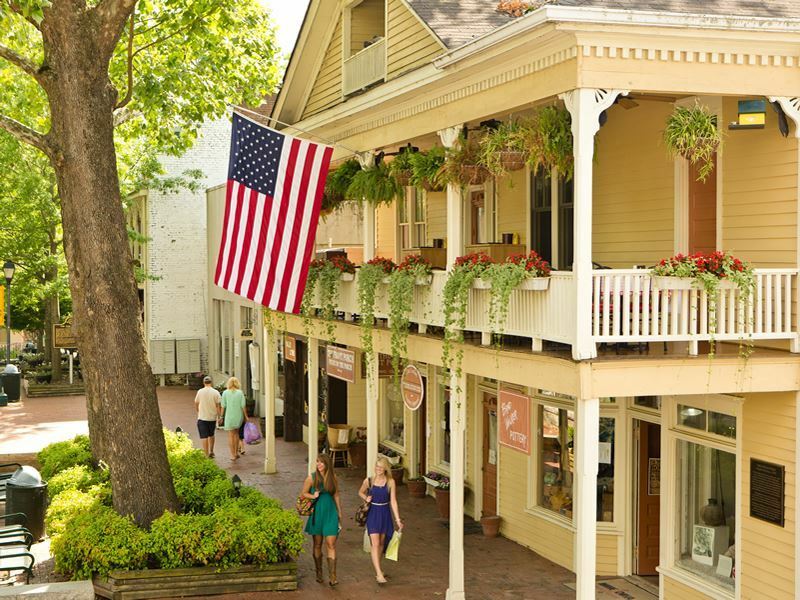 Dahlonega’s charming town square offers a range of great shopping and dining options. With its picture-perfect town square, amazing historic homes district and an array of eclectic boutiques and cafes, Madison is a great day trip out from bustling Atlanta. Taking just an hour by car Madison takes you back to a simpler slower paced time where you can take your time to explore the charming downtown area and take a tour of the historic Heritage Hall, a beautifully restored Greek revival home – now open to the public. For the more adventurous you can visit Southern Cross guest ranch and enjoy great riding on beautiful paint and quarter horses either on its own or as part of a day package. No visit to Madison is complete without lunch in nearby Social Circle at the famous Blue Willow Inn which specializes in traditional southern cooking set in a traditional old south setting. Well worth a day trip and located around a 90-minute drive south east of downtown Atlanta is the charming town of Milledgeville GA. This former capital of Georgia is nowadays home to under 20,000 people but is still able to boast a magnificent Governor’s mansion and state Capitol building. As a former state, Milledgeville is awash with history and fine architecture and was the site of the signing of Georgia’s Secession from the union. Home to three major colleges, including Georgia’s College of liberal arts which is beautifully set in the heart of downtown, the city has a vibrant feel and plenty of trendy cafes, bar and bistros. 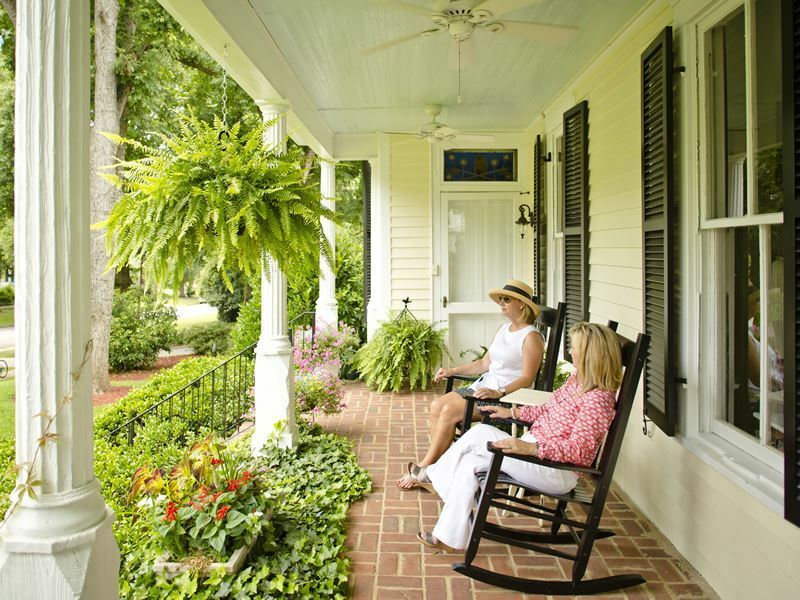 For literary fans, Andalusia, the former home of the renowned author Flannery O’Connor is a short 10-minute drive from downtown Milledgeville and open year-round to the public. 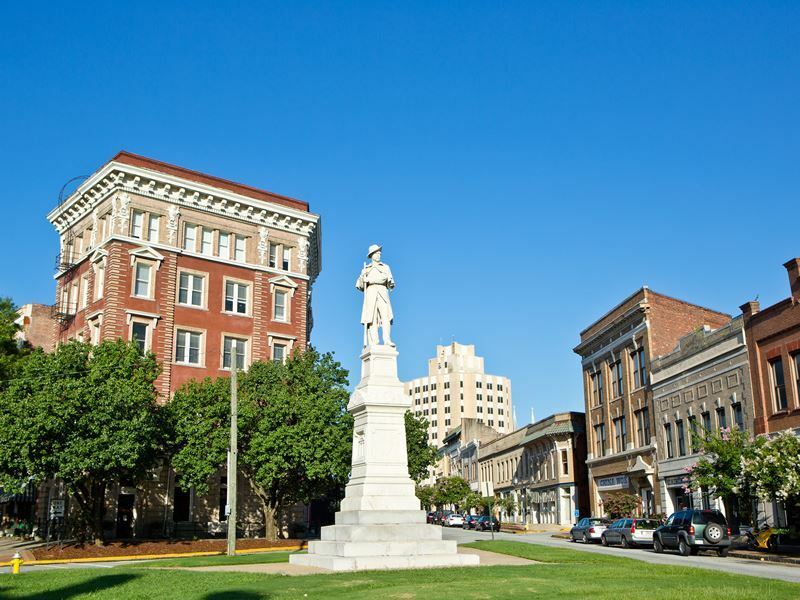 Known affectionately as The Heart of Georgia, Macon is an easy 80-minute drive from central Atlanta and is a great day out from the state capital. For fans of history and culture, be sure to visit The Hay House, an 18,000 sq. ft Italian Renaissance revival mansion, now a National Historic Landmark, and open to the public for tours providing a glimpse to life in 18th century Georgia. The Tubman Museum offers insights the art, history and culture of African Americans. Here you can take a journey from Africa to America and dive deep into African tradition through authentic African Art. If music history is your thing, be sure to take in the Allman Brother Band Museum at the Big House, home to the band members from 1970-73. The museum is full of amazing ABB memorabilia – the largest collection in the world. Another must-see attraction in Macon is the Ocmulgee National Monument, a prehistoric American Indian site dating back to 1015 with over 2,000 artifacts and a fascinating display outlining the lives of the American Indians who occupied the land. For movie lovers, just a half hour drive from Macon lies the charming hamlet of Juliette, setting for much of the filming for the famous Southern movie, Fried Green Tomatoes. You’ll also find the Whistle Stop café still set as it was for the movie and a great spot to take in lunch from a menu, that of course includes Fried Green Tomatoes. Located less than 2 hour’s drive to the south west of downtown Atlanta, Columbus sits on the Chattahoochee river on the state line with Alabama. Right next to the US Army base of Fort Benning is the imposing National Infantry Museum. Opened in 2009 this stunning, state of the art facility honours the legacy and valour of the U.S. Army infantryman. The museum houses over 70,000 artifacts and is home to the Vietnam War Plaza, the World War II Company street as well as the recently dedicated Global War on Terrorism Memorial. Another great educational facility is the Coca-Cola Space Science Center, set on Columbus State University’s Riverpark Campus this fascinating museum hosts an array of NASA Space Shuttle artifacts, a state-of-the-art planetarium and numerous interactive exhibits. 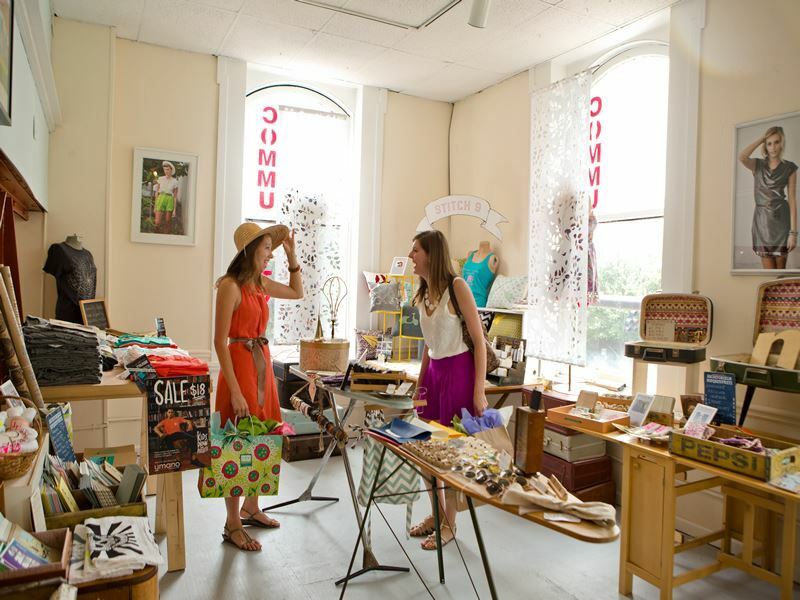 Columbus has a charming downtown (or uptown as some locals call it) area which is typified by the wide expanse of its main street, Broadway, dotted with great shops, bars and restaurants. Close by, the Chattahoochee Riverwalk is a picturesque multi-use path running along the city’s riverbank. Looking for something more active? 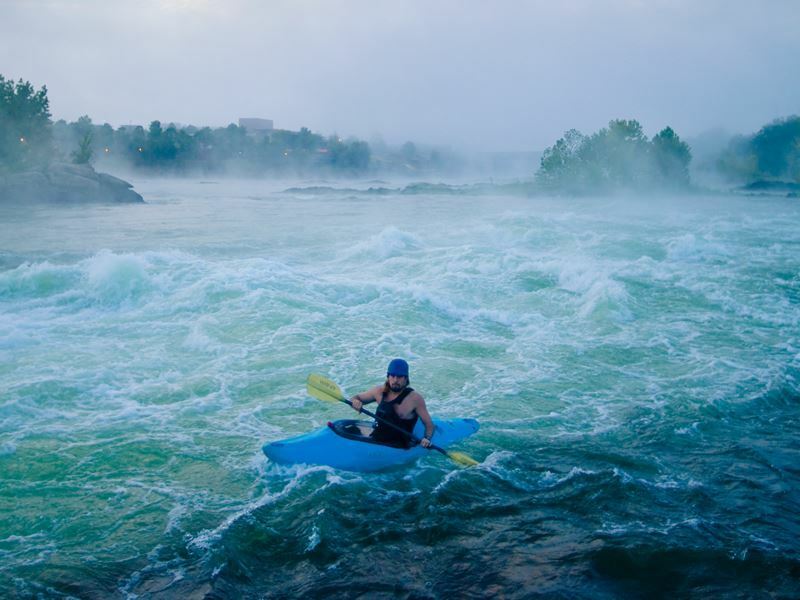 Then why not take an exhilarating zip line across the river (into Alabama) or a thrilling Chattahoochee ride on the world’s longest stretch of urban white water. Nestle in the Northeastern part of the state, an hour and fifteen minutes from Atlanta, is the vibrant college city of Athens. Here you’ll find a thriving music scene, award winning restaurants and plenty of fascinating attractions. For Art lovers there’s the Georgia Museum of Art and Lyndon House Arts Center both focusing on American, Southern and local works. Athens is also home to a burgeoning food and drinks scene with an amazing array of established and new victuals on offer. Breweries such as Terrapin Beer Co., Southern Brewing Company and Creature Comforts Brewing lead a group of Athens craft beer establishments whilst Five and Ten, East-West Bistro and The Last Resort offer award winning dining options. Music and college football are predominant Athens institutions with the city being home to legendary bands such as R.E.M. and the B52’s and UGA’s mighty Bulldogs. Music themed walking tours highlight the rich musical history of the city. The UGA campus is also home to the State Botanical Garden of Georgia a fascinating 313 acre cultural, educational and recreational facility.